I blended this on high for about a minute but I could see it was very pulpy (and I love me some pulp so if I am saying that you know I’m serious!) so I stirred it, added a little extra ice and blended it for almost another minute. It came out beautifully orange! (duh!) and it was very watery except that the foam/some of the pulp rose to the top. It was a bit too much so I skimmed the foamy pulpy part off the top and added a dash of powdered ginger, then blended again. The result was very refreshing and easy to drink. I did notice that the longer I let the juice sit, the more I noticed the pulp. Todd calls it “grit” and he has some serious texture issues when it comes to food, so he was not a big fan. 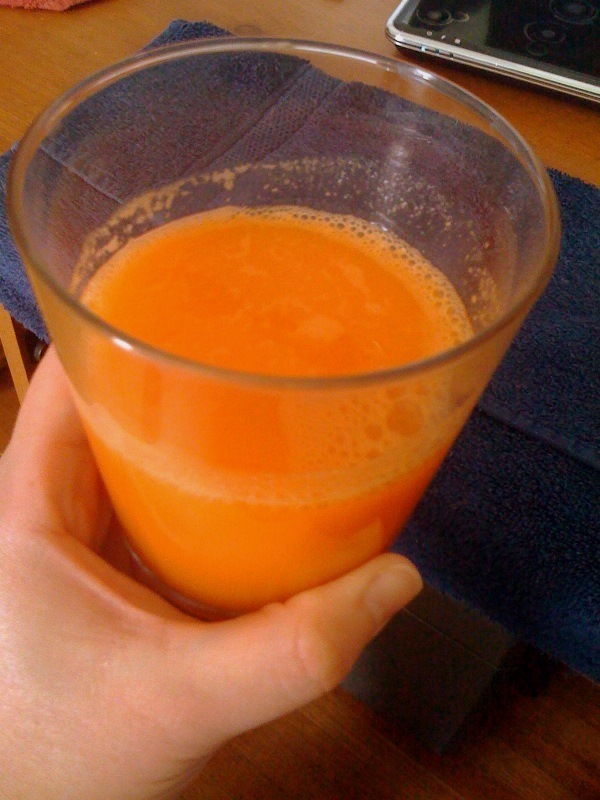 I say drink it right away while it’s cold and watery…and you’ll get all kinds of yummy fiber and beta-carotene for your day! Your heart will thank you! This entry was posted in cooking & baking, health, juicing, nutritarian lifestyle, recipes. Bookmark the permalink.